Marco Missinato was raised in the beautiful ancient city of Rome, Italy. His gift for piano composition began blooming at the age of six. For the first twenty years of his life, Marco’s relationship with music was lived privately, in his room, with a vertical piano, gift of his mother. At the beginning of the nineties, Marco left Italy for Los Angeles to dedicate himself to his passion. In 1992 he graduated as a vocalist from the nationally acclaimed Hollywood Musician’s Institute. One year later he recorded his first instrumental album “Nostalgia”, which he entirely self-financed by singing Italian and international hits in restaurants and clubs. Shortly after the release of “Nostalgia”, Marco met Oscar nominated actress Sally Kirkland (“Hanna”) who engaged him as a composer and singer-musician in the theatrical show “Nonnie Bruce and the Power of Love”. In 1994 he founded Music M his music production company. In the same year he made his singing debut in his next album “ Marco Missinato”. His vast popularity and support from his fans motivated him to record two albums “Amore Italiano” Vol. 1 and Vol. 2, a collection of Italian hits widely successful with the general public. Since he’s been in the States, his music has been featured in numerous theatrical productions, as well as in the television series “Melrose Place” and “Port Charles”. Recently, Marco finished the production of two new albums. 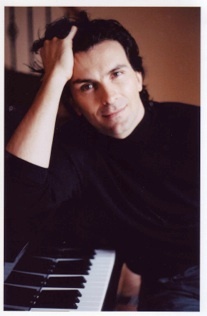 “Naked Soul” features his original solo piano works and is performed by pianist Lilia. “Music to Make Love” is a collection of original instrumental and vocal pieces. He is presently working on the orchestration of Naked Soul whose release is planned for the end of 2010. In addition to this project, he is composing the music for a new solo vocal album.